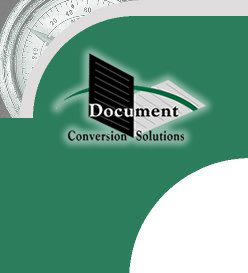 " Your scanning program and other imaging utilities have made a world of difference in our operating efficiency and to our bottom line...I feel quite comfortable recommending Document Conversion Solutions to any paper intensive office or business. Now that I'm hooked, I can't imagine doing business without your imaging system." ---Joel Lackey National Credit Systems, Inc.
" The system we purchased will only enhance our productivity with each additional file imaged. The installation and service you provided was well planned and easy to comprehend...We are very pleased with the results." ---Louise Cocklereece Tisinger, Tisinger, Vance & Greer, P.C.
" The indexing and imaging system that you developed has integrated seamlessly with our database, dramatically improving productivity among our staff...Document Conversion's quality control and attention to detail meant the files were useable faster and without down time for rescanning." " ...Our filing has become neater, more organized and much less bulky than before...We are able to view entire closing packages from the desktop, and are able to print documents, fax, or e-mail documents to lenders and clients immediately upon request."